Nulloy is a modern audio player that lets you easily listen to your favorite songs and create & save playlists with almost no effort. The application is portable, so you don’t even have to go through an install process, plus it doesn’t add new entries to the Registry or change existing ones. The program has a clean and minimal UI, where you can see basic playback controls, a waveform and a pane where all uploaded items are displayed. It’s easy to see Nulloy is really simple to use, and even those with little or no technical experience will have no problems finding their way around. The player can play a large number of audio formats, like MP3, FLAC, MP4, WAV, WAM, AAC, M3U, APE, MOD and OPUS. 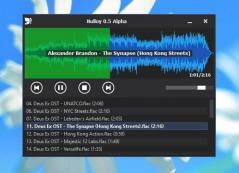 It also lets you quickly save playlists on your hard drive as M3U files. It lets you change the volume of the tracks, repeat and shuffle them, show cover art, but also enable the app to stay on top of other open windows. Furthermore, files can be sorted by name or date and the next file can be loaded in directory when the currnt one is finished. Last, but not least, Nulloy lets you toggle window visibility, and you can control the majority of playback actions via customizable hotkeys. MKV Player is a handy utility that was designed in order to help you view MKV videos.